You already know I love to take our favourites and convert them into something slightly if not lots healthier, right? 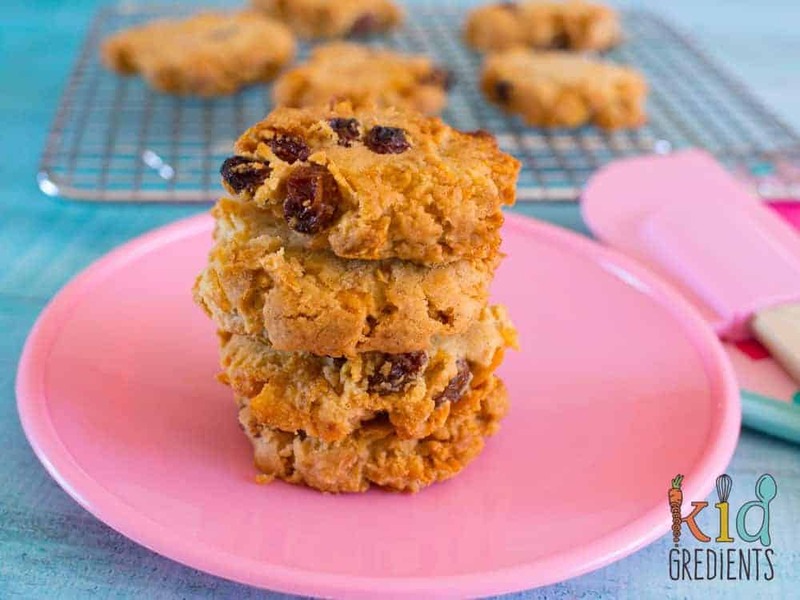 Well these healthier cornflake crunch cookies are no exception. 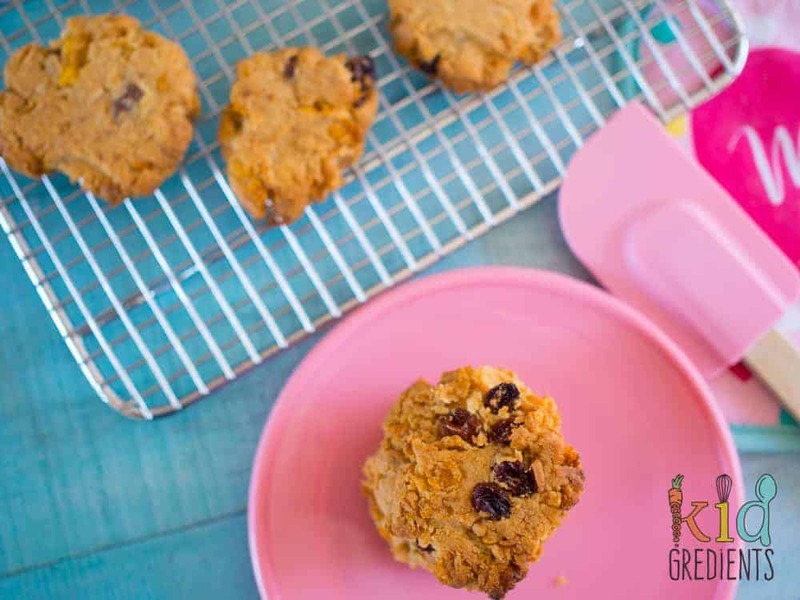 They taste just like the cornflake cookies I grew up with, but are soooo much healthier! The week before holidays, I was so excited about the holidays and everything they bring, outings, cooking with the kids, playdates, fun day trips and lots of fun. What I wasn’t expecting was 2 weeks of snot, fevers, getting up at all hours of the night to the kids before finally succumbing myself with a fever just as Master 4 got better. And here we are, on the last day of the holidays, looking at investment options for kleenex, panadol and nurofen. So I made these cookies the first day of the holidays before snot-a-geddon hit and we all enjoyed them. Except for Mr Kidgredients, he doesn’t do sultanas in cookies. He thinks it’s the ultimate crime against humanity. But there’s no pleasing some people. See that potholder? My Mother’s Day present- so cute! 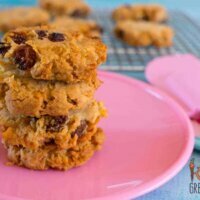 The original cornflake cookies on the recipe box that my grandma used to make contain over 1 cup of sugar added into them. And that’s on top of the sugar already in the cornflakes! So not really that healthy, but you probably already knew that. They do taste great though, and I’ve tried to make these as delicious as possible to counter that sugar loss! They aren’t sugar free, but they have super low added sugar and they freeze well. They are perfect for grabbing and popping in the lunchbox because they defrost and keep their shape. 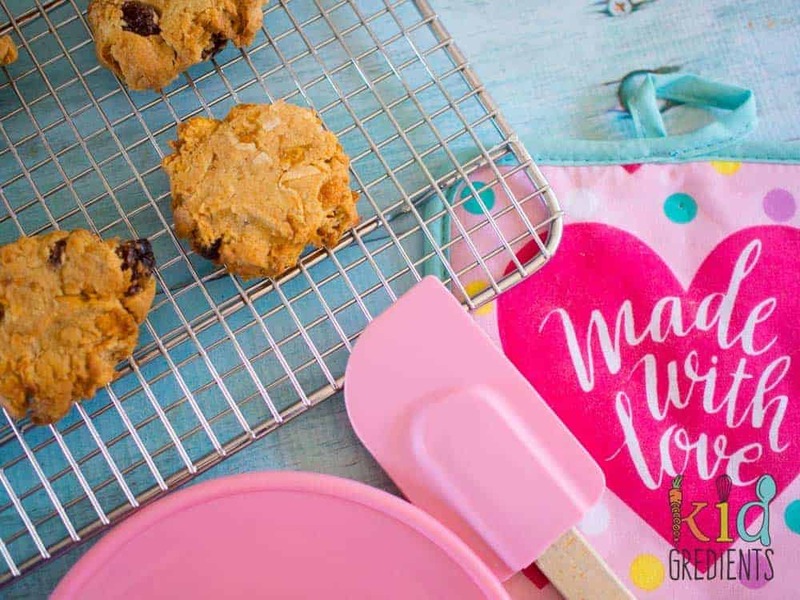 They don’t even involve a mixer, so you can make them easily with the kids without too much hassle. Bake now, freeze for later! 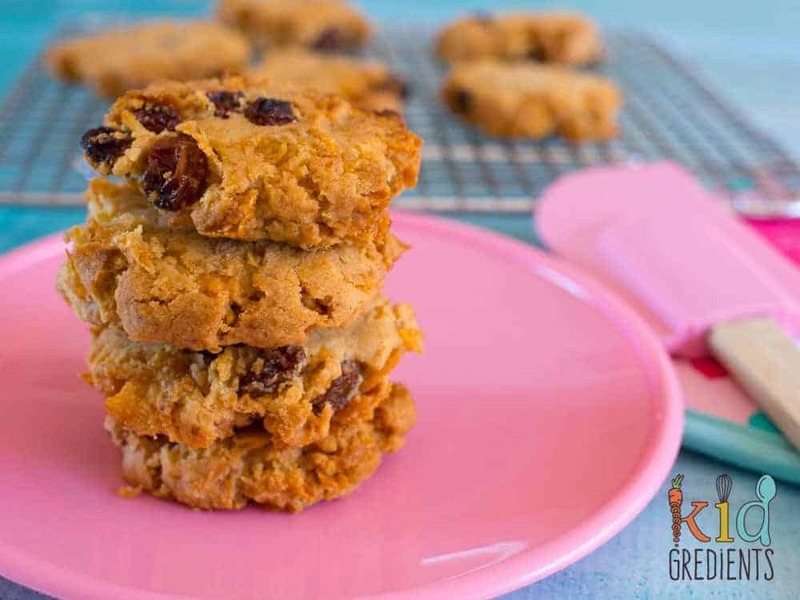 Healthier cornflake crunch cookies with low sugar and lots of crunch! 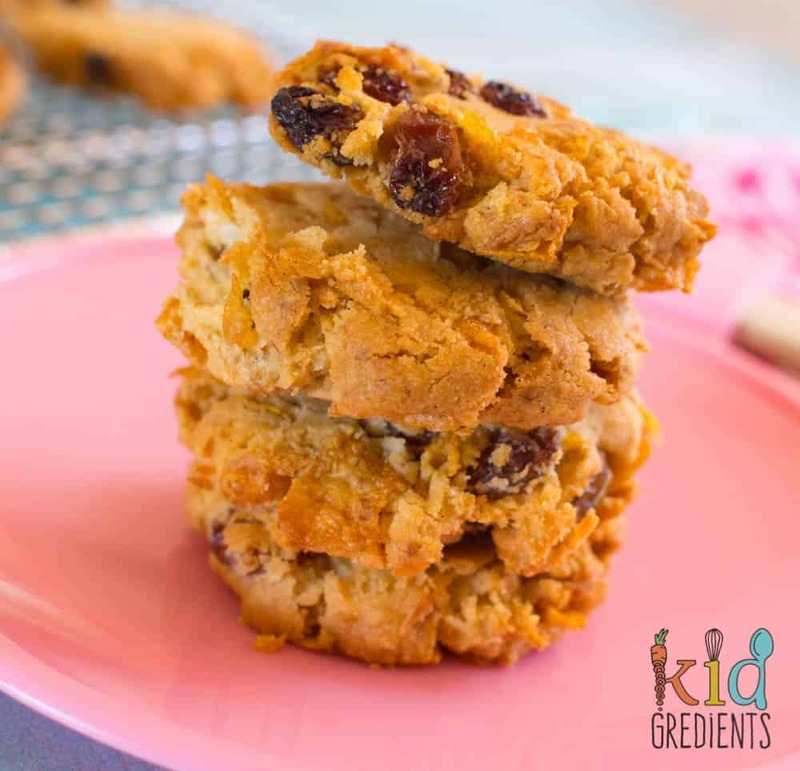 Perfect for snack time, and in the lunchbox, they also freeze really well! Mix together the butter, sugar, egg and vanilla. Add the flour and milk, and mix well. Add the coconut flakes, sultanas and mix in. Mix in the cornflakes, being careful not to crush them too much. Place dessert spoonfuls of the mixture onto prepared oven trays and flatten with a spatula. Cool on the tray 5 minutes then transfer to a wire rack. Previous Post: « Apple and strawberry fruit leather no added sugar and no dehydrator! Ours were dry, is it cos I substitute dark choc chips in place of sultanas ? Possibly, I’ve never tested them with something other than sultanas, sorry about that! In step 2 when you say mix. Do you mean cream with beaters or just mix in a bowl? No you don’t need a mixer for these! Just mix together in a bowl. Yum yum! They sound delish!